Due to inclement weather and road conditions Breakfast at Blake has been canceled. Please register by Monday, April 8. 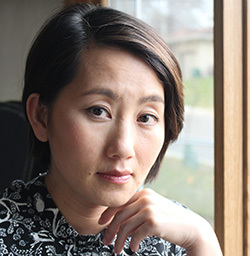 Kao Kalia Yang is a Hmong-American author, filmmaker and teacher and a co-founder of Words Wanted, a company dedicated to helping immigrants with writing, translating and business services. She writes and speaks with passion and eloquence, seeking to deepen the understanding of the human condition to garner more compassion in the world. Born in Ban Vinai refugee camp in 1980, Yang and her family came to Minnesota as refugees in the summer of 1987. Her first book, “The Latehomecomer: A Hmong Family Memoir,” is a first-hand account of the journey many Hmong people have had to make to find “home.” A Publishers Weekly review says, “Yang tells her family’s story with grace; she narrates their struggles, beautifully weaving in Hmong folklore and culture.” The first Hmong-authored book to gain national distribution from a literary press, “The Latehomecomer” is the only book to have earned two Minnesota Book Awards, is the best-selling book in Coffee House Press history and received a NEA Big Read title. When she’s not in front of an audience inspiring social change and awareness, Yang raises twin sons that keep her and her husband busy at their home in Minneapolis. In her Breakfast at Blake presentation, “Storytelling and the Hmong Experience,” Yang will discuss with great intimacy, perspective and grace the refugee and immigrant experience, issues in literacy and education, race, class and gender. This event is complimentary and includes a full breakfast. Yang will be available to sign books following her presentation.